Tech startup Misfit Wearables and 120-year-old Austrian jewelry maker Swarovski have come together to put out the Swarovski Shine, a collection of accessories for women paired with two new fitness and sleep trackers. 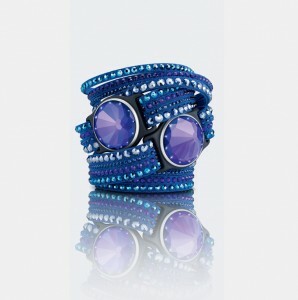 The trackers include a clear crystal face and a violet crystal face. According to Forbes, the violet tracker is the one that is solar powered by making the crystal bend the light onto the tiny solar cell lying underneath the crystal. And the solar harvesting will only work with the violet crystal tracker because the violet color makes the light more intense, said Joan Ng, a senior vice president at Swarovski–the clear crystal doesn’t produce enough intensity. It takes 10-15 minutes of sun exposure to power the wearable for a few days. The new trackers are being offered in a set along with different accessories, like a pendant or sports bracelet. Prices range from $169 to $249. All of the new accessories, which can be purchased separately, can also be used with the Shine tracker.